Welcome to the first adventure in the ZEITGEIST adventure path! In factories throughout the city of Flint, months of ceasless toil by mages, engineers, and shipbuilders have finally concluded. Now well-wishers from across the nation of Risur have come to witness the launch of the world’s mightiest vessel of war: the R.N.S. Coaltongue, impervious to spell and cannon and armed with fire that could slay even a dragon. On the docks, constables keep a close eye on celebrants and troublemakers; in the shadows, conspiracy and betrayal threaten this technological titan on its maiden voyage. An adventure for 1st level heroes. Remember to check out the free Player's Guide and Campaign Guide, also available right here at paizo.com! This adventure-module for the Zeitgeist-AP is 59 pages long, 1 page front cover, 1 page editorial, 1 page ToC, 1 page SRD and 1 page back cover, leaving us with 54 pages of content, so let's check this out! All right, still here? Then onwards! Because of the espionage/conspiracy-theme of the AP, a roster of NPC-handouts is provided for the DM to keep track of the movers and shakers, but more on that later - The PCs, agents of the RHC (Royal Homeland Constabulary), have prepared for weeks for an interesting event - the Coaltongue, Risur's first steam-powered ship is off to its maiden voyage and the king will attend - thus, their first task will be to check upon the crowd (potentially helped by a portentous dream) for potential troublemakers. Creating threat profiles, recruiting cops to fleece the crowd and dealing with the troublemakers makes for a rather cool and unconventional first encounter, based massively on skills and roleplaying - awesome! Even better, the AP addresses a pet-peeve of mine - since the PCs are good guys working for law and order, their training involves not killing their adversaries, making subdual damage a central mechanic and the PCs able to deal it. While a brawl is possible, a non-violent solution is preferable. And better yet - a duality between dockworkers and policemen is already introduced, delivering the first array of consequences for their actions. And the PCs do get a prompt reward - after being introduced to Principal Minister Harkover Lee, bodyguard to the king, they are bidden abroad the coaltongue to first socialize and keep an eye on potential threats (and there are a lot of interesting characters and even philosophical debates going on) before the king gets on board. After socializing and meeting with some rather cool characters and movers-and-shakers of the nation, the PCs will be warned that a certain individual has not yet shown up - and the chase in on, for the person is gone and a certain handmaiden is up to no good, trying to sabotage the boiler of the ship! Worse, with the firedust and the rather complex mechanism, a simple disable device-check will not be enough - instead, creative thinking, fast actions etc. will be required to contain what could turn out to be a catastrophic chain reaction of explosions that slays the king and everyone on board. Hopefully, the PCs are up to the task! Unfortunately, though, the mastermind behind the assassination is by this time already gone with the winds and until the minister of outsiders, Lya Jierre challenges the PCs with a puzzle one week later, they have to bide their time and wait for civil war. Thankfully, the minister is here to bend the rules - to prevent a war, she orders the PCs to accompany the RNS Impossible to an attack on the Axis Island, where the duchess responsible for the sabotage is hiding. The army's infiltrators will go first and if anything goes awry, it's the PCs turn. The operation has to be done in less than 3 days to ensure no political ramifications and Lya also wants the PCs to rescue a relative of hers. Guess what? Bingo, they botch the job. Well, at least the PCs get supplied with mission critical equipment by the RHC. Entering the island via a sea-cave and finding some perplexing relics, the PCs make their way past half-mad survivors to the fortress of Axis Island - and its sea-gate, which the PCs should open if they want to have any chance to retake the island. After an infiltration of the lighthouse (and the potential to botch royally), the stakes are up, though, and the PCs will be sorely challenged by a hold-the-line type scenario, where the PCs have to keep enemy forces from entering the lighthouse and can use a staggering variety of skills and methods to keep the enemy forces at bay. After this section of the invasion, PCs will witness the legendary elf-warrior Arabey emerge as a stowaway from one of their ships, cutting a swathe through both their men and the duchess' guards - and after a prison interrogation, the PCs have a chance to follow the legendary warrior into a strange phenomenon of reality-ripping into a fey-inhabited, slightly burning hedge-maze before they can enter the central tower - where they can hear the duchess, Arabey and Nathan Jierre discussing the weird political situation and the enigmas brewing - and have a chance to take the legendary elven one-man dreadnought down: Though he is level 15, he is down to 1 Hp and a lucky PC may actually take him down and capture him. Anyways, the PCs have hopefully averted open war between the nations of Danor and Risur and realized that the elven Unseen Court also has stakes in this grand game, which will be continued in #2. The pdf also provides a quick reference-list of NPCs, 1 page of dramatis personae (including mug-shots),2 handouts for the assault the lighthouse-section of the module, a full-page map of Flint and 8 pages of player-friendly maps, with only two of them sporting keys and numbers that may give away locations - since, however, both are of overland locations and don't contain spoilers, I won't rate this down. Editing and formatting are top-notch, I didn't notice any glitches. Layout adheres to a beautiful full-color standard and as per the free guides, the pieces of artwork featured herein are mostly stunning and mind-boggling. The cartography is just as impressive and also in full-color and the amount of maps provided is stellar indeed. The pdf, gorgeous to look upon as it is, will, just like the guides put a brutal drain on your ink reserves - unless you make use of the layers of the pdf, which let you customize the adventure to set how much you're willing to spend ink-wise. The pdf comes fully and extensively bookmarked. Wow. Honestly, I knew that the crew of ENpublishing is good - I do own the War of the Burning Sky. This one mops the floor with just about every installment of aforementioned AP - the encounters are diverse, challenging, focused on intelligent roleplaying, provide action galore and add a sense of identity and "being different" to the AP that is a joy to behold. Zeitgeist is different from other APs and it is proudly, boldly even so judging from this module. Better yet - this first module is free to get you hooked and it does a stellar job of doing so. This is by far the best free module I've read for PFRPG - with top-notch production values and enough ideas to fill multiple modules. While the lack of a printer-friendly version is a pity, the layers do their job and this module still remains a truly excellent adventure and thus my final verdict will be 5 stars + endzeitgeist seal of approval. Zeitgeist: Island at the Axis of the World is not your typical pathfinder module. This adventure path has more in line with a movie or a story rather than a set place where stuff happens and the PCs just pick up the pieces. Whilst reading 50+ pages of well laid out text, gorgeous artwork, and spectacular maps I was trying very hard to picture how this victorian style/fantasy steam punk type game would mesh with my own campaign. 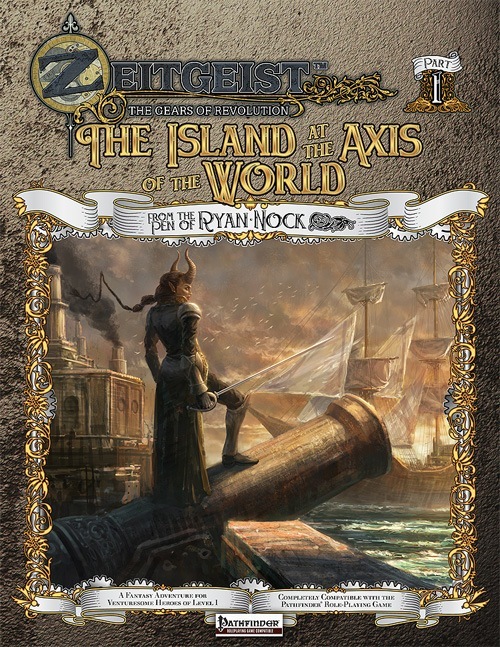 The module hass guns (Paizo's beta ruleset), magical steam ships, jungle lighthouses with magic sprinkled in there to make you feel that all of this COULD be possible, but how can I shoehorn this all into my game? Answer: I can't at this time. My world doesn't mesh with this one, I wish it did so I could work through all the lovely story which whisks your characters from one locale to another, nonstop Indiana Jones rushing around until the final climatic battle at the end of the module. Maybe my next game I can use this or steal bits from later modules as I know that there is enough crunchy material to go around. *NPCs may be overpowered in the end scenario, they are supposed to. *Will drain your printer dry printing this thing, would like a barebones setting. This book, like the Player's and Campaign Guides before it, is simply beautiful. 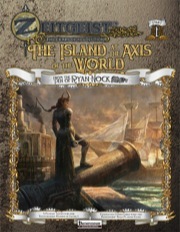 The full color page design makes it pleasant to read, the illustrations do a great job of bringing the unique world to life, and the maps are detailed, clear, and interesting. I'm a huge fan of having so many maps on so many different scales. We've got the World Map, a map of the titular Island, several City-level maps, and a panoply of tactical level battle maps. The battle maps are particularly well thought out, with helpful annotations for elevation that make it much easier to understand where things are relative to each other. The handouts, particularly the NPC handouts for the PCs are a stroke of genius. It is obvious that a lot of thought went into this campaign from the very beginning. Having a simple way to keep track of the cast for both the players and the DM is a tremendous time-saver, and will spare me a lot of frustration when I have to remind the PCs for the third time who they're talking to. This first adventure was a real pleasure to read for me too, on a DMing level. Each scene is tagged with various descriptors that make it obvious how it should be approached like "social", "tactical", "real time", or "montage". Again, it's clear that a lot of thought went into making each encounter and challenge both interesting and unique. Of particular note, just looking at Act I, we have a minor investigation that makes use of a very nicely designed extended skill check with a hard time limit, and a set-piece battle with a plethora of modifiers, counter-modifiers, environmental hazards, unique items, and a ticking clock. These are the kind of well thought out encounters that make running a game like this fun. That a series of possible outcomes and alternate solutions, complete with real repercussions, were also detailed makes my life that much easier, and deserves a huge thanks. Length-wise, I think this adventure looks about right. That is, I think that my playing group should wrap it up just in time for the second one to be released. Or about 3 months time playing 4 or so hours a week (with, no doubt, several weeks off in there). Only time will tell! I sure hope so, because my players are excited about this game in a way that they haven't been for months or years. There's just something about a steampunk D&D world set in Central America with strong philosophical overtones that they find compelling. My only real complaint is that the battle maps are pretty low-res when I try to pull them out of the PDF to print. It'd be nice if nice big JPGs of these maps were available. On the whole, this adventure is everything I was hoping for and, honestly, a good bit that I didn't know to hope for (but will now find sorely lacking in other products). Bravo to the entire team for putting together a really top-notch product. Game on! Going to DL it and check it out, along with the rest of the support stuff. Yup. Totally free, just like the Player's Guide and Campaign Guide. Is this AP inspired by the writings of China Mieville (Perdido Street Station, et al)? I downloaded it and gave it and the two guides a cursory reading. I must say that I am intrigued by the setting, it is very much what I have been waiting for. On the other hand I am disappointed on the lack of crunch. I expected more than the re-themeing fluff on the character classes, as nice as these tie into the whole setting. Alternate class descriptions with a few rules would haven been nice and certainly doable. Still I will likely buy the adventures when they become available here at the Paizo store (but I have no interest to again open another account somewhere else in order to place an order). The module was first done as a 4E adventure. With enough encouragement the module was moved over to PF. I agree that there is not enough crunch material in here and I mentioned this to the author and to the folks working on going from 4e->PF (it's a b***h) and they promised that future adventures will have more crunchy PF bits in it, they just ran out of time. Also, most of this module, the adventures/dm guide are now up on D20PFSRD.com. EN Publishing has been most gracious in sending us the material to add to the site. We're really glad you're liking it so far, guys! We were a little nervous about writing for Pathfinder, so we hope it's paid off! And some details of the maps for this are up here. This was a blast to work on, and the pdfs look gorgeous. Great work! I'm curious if the firearms rules for the setting and path are compatible with the Gunslinger class from Ultimate Combat. Will all of the future releases have a softcover edition as well? Reading this and so far it looks really awesome. Im very pleased with it but wondering when the next part will be released - Anyone know? Yes; ZEITGEIST uses the Ultimate Combat firearms rules. And reviewed here, on Lou Agresta's RPGaggression, submitted to Nerdtrek and sent to GMS magazine. Cheers!